So, if you’re reading this, you probably have a 6 month old baby. It happens! The baby is at the same time, probably the greatest source of joy and stress in your life. It’s funny how that is, but that’s life for you. Logically almost inexplicable, which then explains the commonly present gap in understanding between those who have children and those who don’t. Anyway, if you have a 6mo baby, a big part of your “parental fatigue” comes from having to entertain this new love of your life (click here for some parental fatigue relief). So, here’s a few things you can try – in no particular order. All kids are different, so what works for one might not work for another. The “effective times” below are from my baby boy. Many of these will still work till around 10 months old. Important! All the following must be done with close supervision. None of the below can be done with the baby unsupervised! Have him watch other kids playing. E.g if a child is playing with legos, put him as close as you can to that child (e.g. 1m away). I often have my kids play in front of the baby, whilst he sits in my lap (actually, I just go to wherever my kids are playing with the baby). -Effective for up to 30 minutes. -Side effect: if the kids leave before the baby is satisfied, might induce wobbly! For this, you’ll need a balloon tied to a short string (maybe 30cm long string). Hold the baby on your chest “in a seated position”, facing the same direction as you are. In order to do this, you will have to fold one arm, which the baby will sit on, and you’ll be holding him in place with your other arm. Put the string in your mouth, and the balloon will drop in front of the baby. He’ll try to catch or hold it, but he will not be able to. He should have a great laugh though (my baby did). This game can last for a while. If you do not have a string, you can get someone to play in front of him. He should touch it a few times per minute, either with his feet or arms. Just to be clear, this can’t be a helium balloon, it’s got to be a regular balloon. 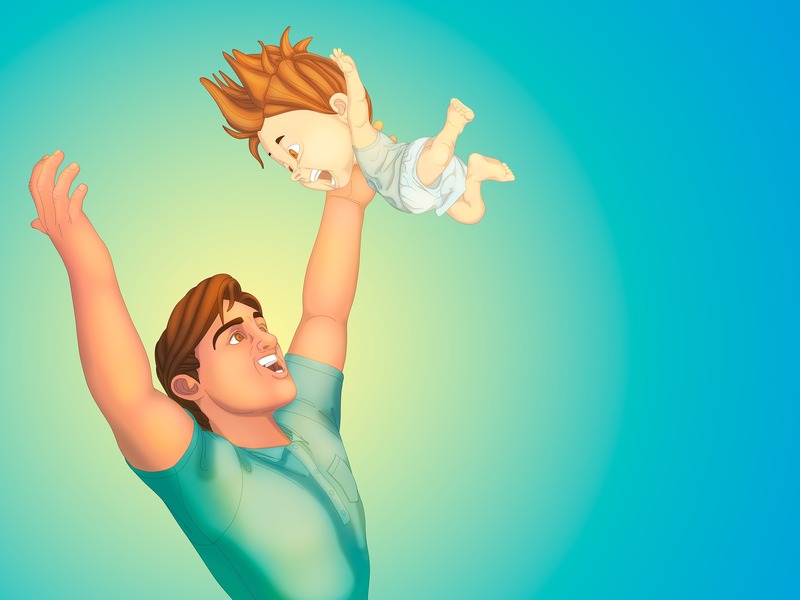 Swaying may not be perceived as manly by some, but your baby probably likes it. Add to that singing, and your baby will love it. Don’t worry if you have a terrible voice or can’t hold a tune. Both of those apply to me and my baby still enjoys my singing in a way that no one else in my family (or the rest of the world for that matter) does. My baby also likes loud music (e.g. Metallica more than Taylor Swift – it’s a mystery, but it works for me!). -Effective for as long as you can last. -Side effect: might put the baby to sleep. Take him outside. The change in atmosphere has an immediate effect. You can go for a walk or do some laundry. Taking him up to anything which he has not seen before, will spark his interest. So you can walk up close to trees for example, and it will pique his interest. If you need to do some laundry, put the baby in the push chair, so he can watch. When my son gets bored, I hold him in front of a mirror and talk to him. As long as there is something to talk about, this can last for quite a bit, though I admit, that I often get bored of talking to myself. -Effective for up to 10 minutes. And that’s it! All my wisdom regarding 6 month old babies in under 750 words. I hope it was useful to you! Have I missed any? Let me know! Author: Parent Bear is a dad of 3 who writes about fatherhood and runs the online “tee and onesie” shop of the same name. Find him on twitter, FB, instagram or at the site.